Live Encounters | Anat Hoffman – A Wall That Wails For All…. The Kotel has been handed over to the care of ultra-Orthodox Rabbis who manage the area as if they are living in a medieval shtetl. They impose their interpretation of religious modesty on all who come to pray there. In the separate women’s section of the Wall, women are not permitted to sing or pray out loud as a group. They are not allowed to wear a tallit or to read from a Torah scroll. These acts of religious devotion are normal in many synagogues around the world, including in Israel, but at the spot to which all Jews turn when they pray, regardless of where they are in the world, the sound of a woman’s voice is a crime. When people ask me about my arrest in October 2012 for wearing a tallit at the Western Wall, they often want to know what was the reaction inside Israel itself. We had hundreds of articles about the arrest in English, French, Spanish, Russian, and others from news sources abroad, but not one single article in Hebrew for local Israeli consumption. Journalists here did not understand why it was a worthwhile story, or how the treatment of women at a “holy site” that very few Israelis go to on a regular basis has any impact of them. 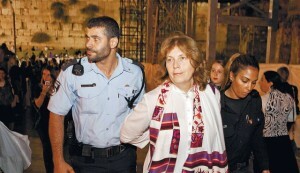 Anat Hoffman is a major leader for social justice in Israel. She is perhaps best known for never giving-up, even when faced with seemingly insurmountable obstacles. Anat was born and raised in Jerusalem and she served in the Jerusalem City Council for 14 years, leading the opposition to the right wing and ultra-Orthodox administration. She was a founding member of Women of the Wall and continues to be a tireless advocate for freedom of religion and women’s rights. In 2002, Anat Hoffman became the Executive Director of the Israel Religious Action Center (IRAC), the legal and advocacy arm of the Reform Movement in Israel. IRAC’s goals are to promote the values of religious pluralism, human equality, social justice and religious tolerance in Israel and to protect the rights and strengthen the public standing of the Israel Reform Movement and its congregations.